Dorris Intermediate School 5th grader Margot Schusky can’t decide if she wants to study medicine or political science when she gets older. 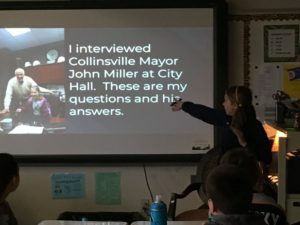 A project she did as part of her school’s enrichment program gave her an inside look at what it’s like to be Collinsville’s mayor – and led her to invite the mayor to her classroom as part of her final presentation. Enrichment programs are an opportunity for students to apply, deepen and extend their classroom learning. In CUSD 10, students identified as potentially benefiting from additional learning opportunities utilize Renzulli Learning — an interactive online system that provides a personalized learning environment. The Renzulli Learning System (RLS) “quickly identifies student academic strength areas, interests, learning styles and preferred modes of expression and then matches each student with a vast array of educational activities and resources.” Students take an online quiz to determine their interests, then the program guides them to explore relevant subject matter. Margot and her classmates who also participate in Renzulli Learning, jokingly refer to the program as “Ravioli.” Their projects are in addition to regular coursework. Margot Schusky’s project “The Job of a Mayor” was prompted by her interested in local government. She said she might want to hold an office like mayor someday, so she wanted to learn about it. 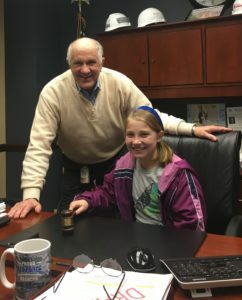 When CUSD 10 was closed on Monday, March 4, 2019 in observance of Casimir Pulaski Day, Margot went to Collinsville City Hall to interview Mayor John Miller. 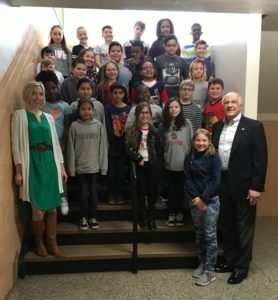 The interview went so well, Margot invited Mayor Miller to visit her classroom as part of her final presentation. Margot says the most awkward moment was when she asked the Mayor about his pay. She was surprised to learn being a mayor is not a regular workday job. “The students are following their own interests and creating projects to enrich our learning environment. It really has blossomed into a learning experience the students invest in,” adds Giacoletto.